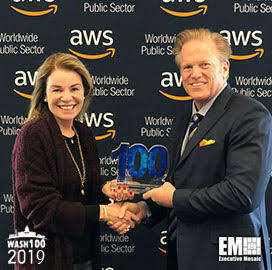 Jim Garrettson, founder and CEO of Executive Mosaic, presented Teresa Carlson, vice president of worldwide public sector business at Amazon Web Services, with her 2019 Wash100 Award for the fifth consecutive year on Monday. 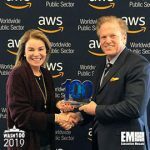 Executive Mosaic recognizes Carlson for her efforts to utilize cloud-based platforms and applications to inspire innovation in government markets. We are honored to present the most coveted award in government contracting to Teresa Carlson of Amazon Web Services.